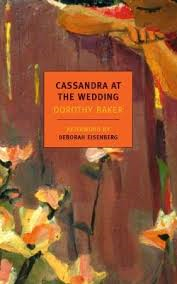 One hope I have this year is to read more women writers than last, so when I was recommended Dorothy Baker’s final novel, Cassandra at the Wedding, by Jacqui over at Jacquiwine, it seemed the perfect opportunity to acquaint myself with a writer I had never encountered before. It’s perhaps not entirely unsurprising that Baker was a new name to me – her four novels appeared sporadically between 1938 and 1962, with the first and last rescued from oblivion by the New York Review of Books in 2012. Her second novel, Trio, was adapted by Baker and her husband into a play shortly after publication, a fact I found interesting considering Cassandra at the Wedding’s dramatic structure. Although split into three parts (the first and third from Cassandra’s point of view, the second from that of her sister Judith), part one’s division into three chapters gives the novel the feel of a five-act play. This is intensified by its largely single setting, and the way in which Cassandra’s arrival triggers the introduction of the other characters (her father, grandmother, and sister) with further characters appearing in later acts (Judith’s fiancé, Jack, and Cassandra’s therapist, Vera). Like many American plays of the 40s and 50s, it places a family together to reveal the tensions and secrets beneath the surface. Although the wedding is the ostensible reason for Cassandra’s arrival, it is Cassandra, and her relationship with her twin sister Judith, that is the focus of the play – with Baker arranging for the marriage itself to be downplayed, almost an aside. The list echoes everything she is not doing – she hardly eats, has becomes sunburned on the journey (a nice touch, the burning representing her frenzied mental state), finds she can no longer hold her breath for long (the sisters were swimmers), and refuses to write, anxious she could not live up to her dead mother who was a writer. Everything is put off until she has Judith, and it is little wonder that she attempts suicide when she discovers Judith intends to go ahead with the wedding. (Death has been in the air since the start: when she says, “The bridge looks good again”, in the first few pages she is not referring to the view). It is, of course, Jack who saves Cassandra, rather than her therapist, Vera, whose desperate drive to her side echoes Cassandra’s own sudden decision to head home a day early to be with Judith. We finish again with the bridge, in a scene which could be regarded as optimistic or fore-shadowing something much darker – perhaps a prophecy we do not understand. Cassandra at the Wedding is a wonderful book – thanks again to Jacqui for suggesting it. You are currently browsing the archives for the Dorothy Baker category.